The first two episodes of this BBC miniseries only hint at the delights to come. A lawsuit aimed at church reform in the town of Barchester forces a decent middle-aged clergyman (the august Donald Pleasence, best known in the U.S. for the Halloween movies) into a moral crisis and a conflict with his son-in-law, a pompous archdeacon (Nigel Hawthorne, The Madness of King George). The gracefully written and acted narrative shows glimpses of dry wit—but in episode 3, the arrival of a new bishop (Clive Swift, Keeping Up Appearances), his imperious wife (Geraldine McEwan, The Magdalene Sisters), and his devious chaplain (Alan Rickman, Truly Madly Deeply, the Harry Potter movies) launches The Barchester Chronicles into a satirical power struggle all the more mesmerizing because of the smallness of the territory. The scheming of the citizens and clergy of this British town is both Byzantine and wonderfully comic as the tempestuous personalities claw and dig at each other. 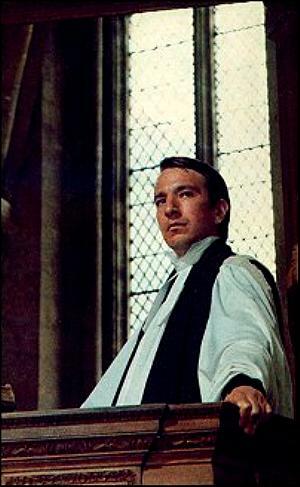 Rickman, in one of his first film or television roles, turns in a tour de force of oily ambition. McEwan's ferocious machinations are downright terrifying, while the sputtering Hawthorne (The Madness of King George) seems constantly in danger of bursting a vein. At the center of it all is Pleasence. Making goodness compelling has always been difficult, since wickedness is always more dramatic; but Pleasence brings a deep and stirring passion to his role that proves as engaging as all the back-biting that surrounds him. And these are just the more familiar faces; a host of lesser-known actors give equally superb performances. The final episode (of seven) will have you on pins and needles. The Barchester Chronicles, adapted from two novels by Anthony Trollope, is one of those marvels of British television, a skillful production that proves intelligent fare can be hugely entertaining. It is very good entertainment.